Collecting data is nice, but not a value in itself. 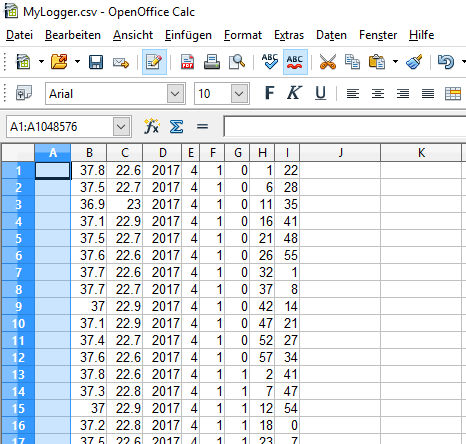 We collect data with our logger to actually do something with it. 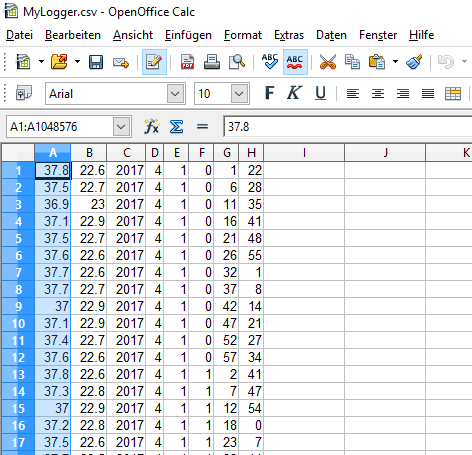 To process our data further I will use OpenOffice Calc by Apache (https://www.openoffice.org/product/index.html). 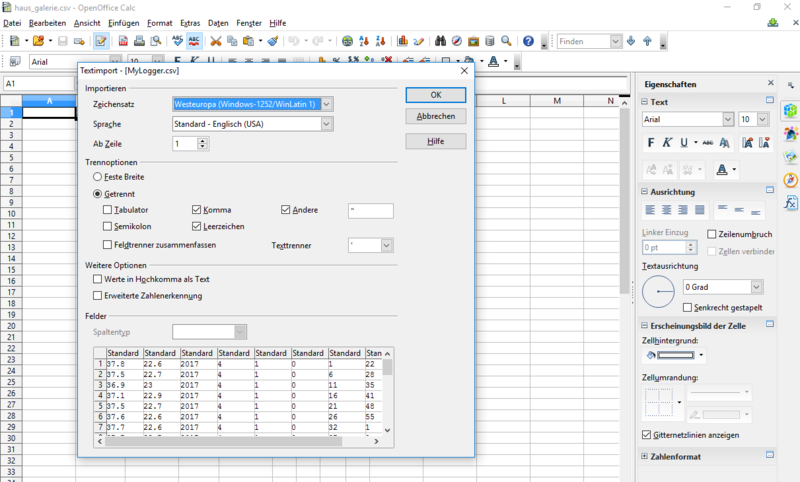 Why Calc and not Excel? Various reasons: it’s free, it’s open source, it’s available for Windows, Linux and Mac and, most important, it is very user friendly for processing data. 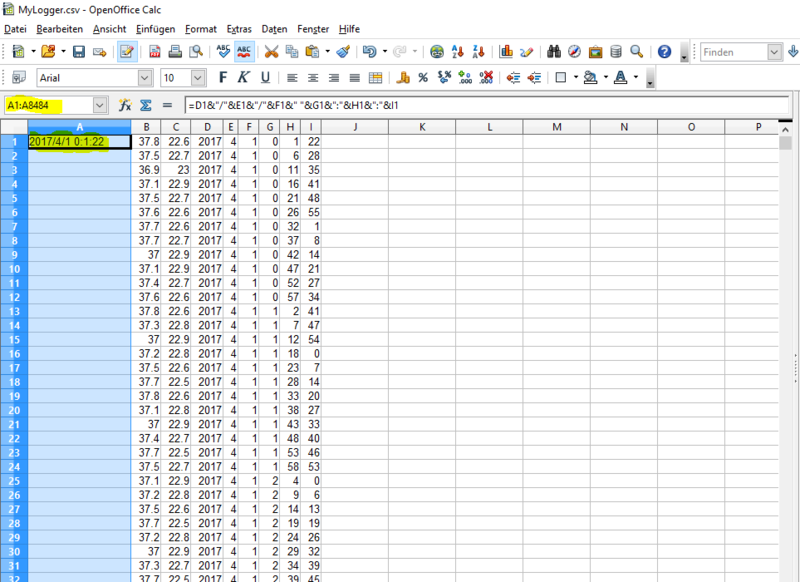 It beats Excel on many fields, at least in my opinion (I will follow up with an Excel part of this, though). Yours might be in English, though. 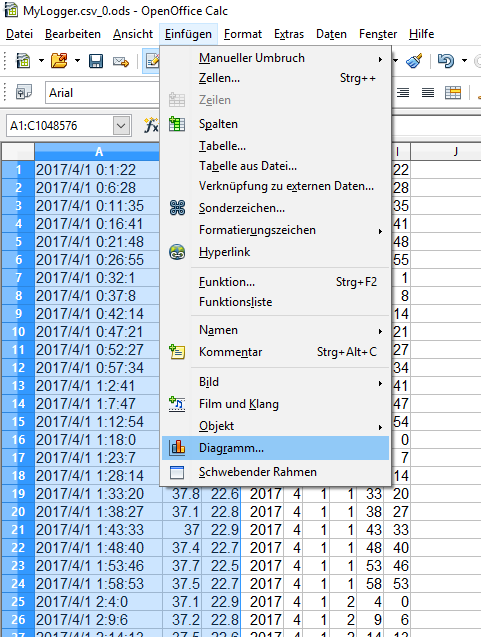 Basically the program suggests to make a spreadsheet out of your comma separated values using the comma as marker for the columns – which is exactly what we need. If you used different separators, you can adjust this in this dialogue. Once you are satisfied with how the preview looks you hit “OK”. 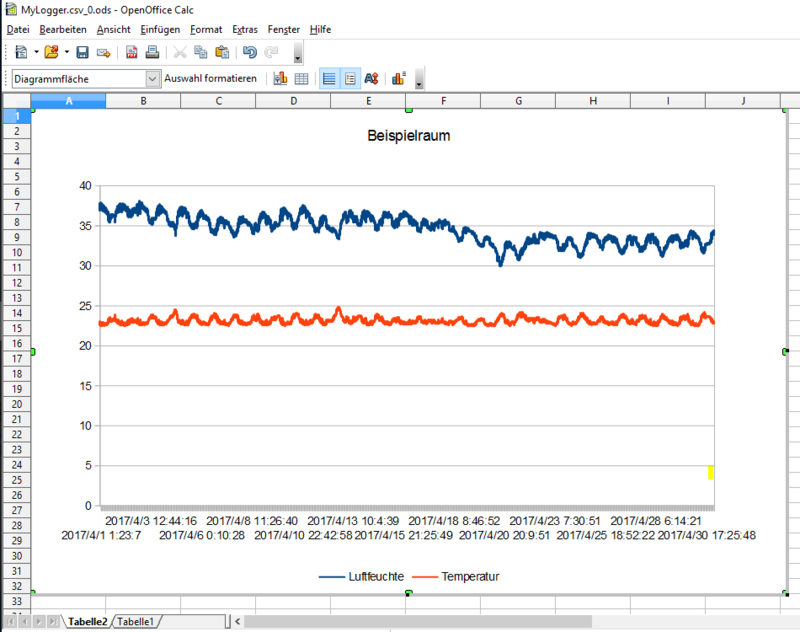 While we could make a graph for temperature and humidity right there and then, it’s probably better to have our date and time in a format we can use. We could have fixed this in our software already – but nobody is perfect, we just note this for our improvements. 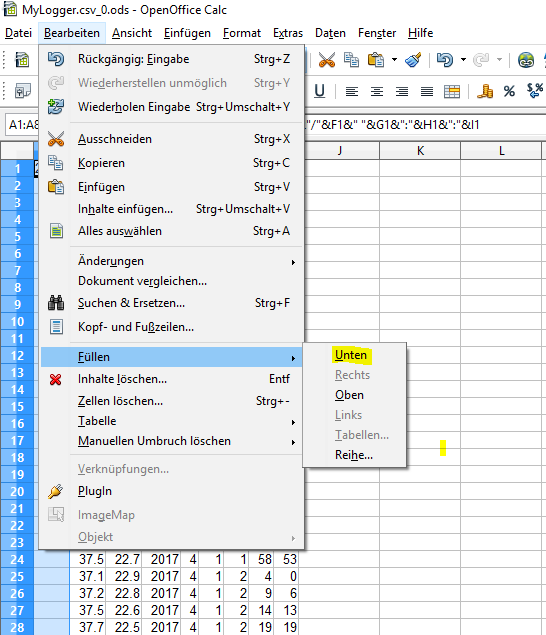 For now, we just add another column to our spreadsheet: we mark our column A and choose “Insert”–>Column. A new column A appears on the left of our original column, which is now “B”. Our new empty column A. The formula entered and executed. We want this in all our A columns, right? But we first have to see how many rows of data we have, so we look into our last row, which is in this case the 8484, yours might be different. We now go to the address field, write “A1:A8484” and hit enter. This tells our Calc that we want to do something in all A fields from A1 to A8484. That’s why these are marked now. We select all our A fields in the address field. Now comes the trick. From the “Edit” menu we choose the “fill” option and choose “down”. 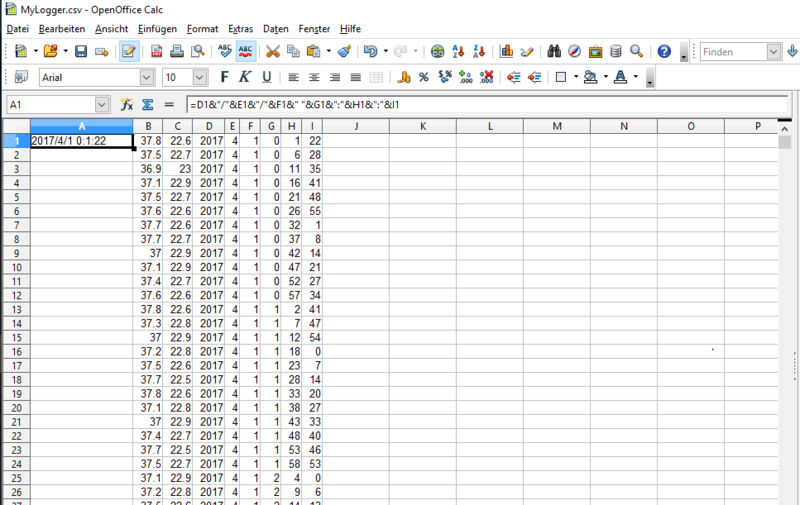 Now all our data sets have a nice time stamp made from columns D to I. From the “edit” menu, choose “fill” and then “down”. Choose the “diagramm…” option from the “Insert” menu. For the diagramm type we choose “lines”. 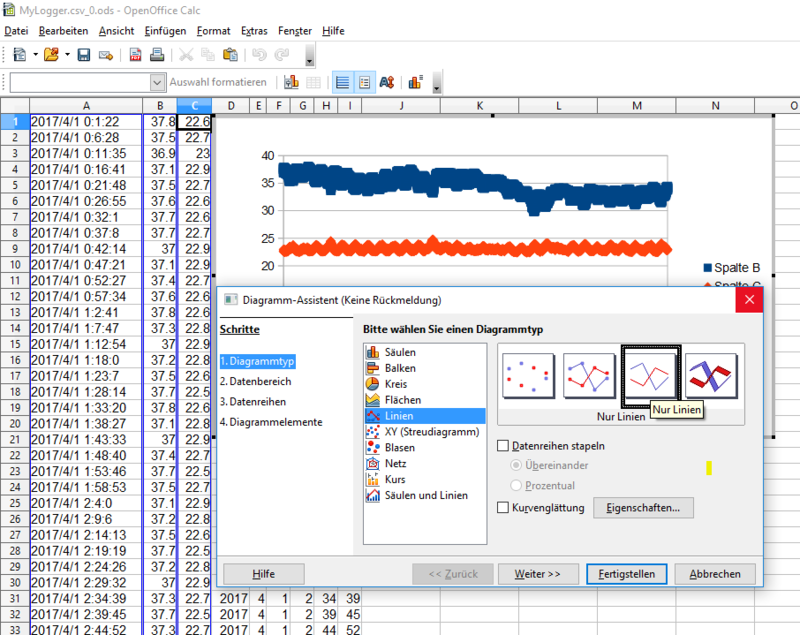 In the background we already get an idea of how our graph will look like. We choose the lines for a type. We can now hit “finish” or do some adjustments like giving our diagramm a title. As soon as we hit “finish” we have a graph that we can drag around, enhance and even cut out and paste in a new spreadsheet, just as we please. There, we have a nicely enhanced graph in an added spreadsheet. 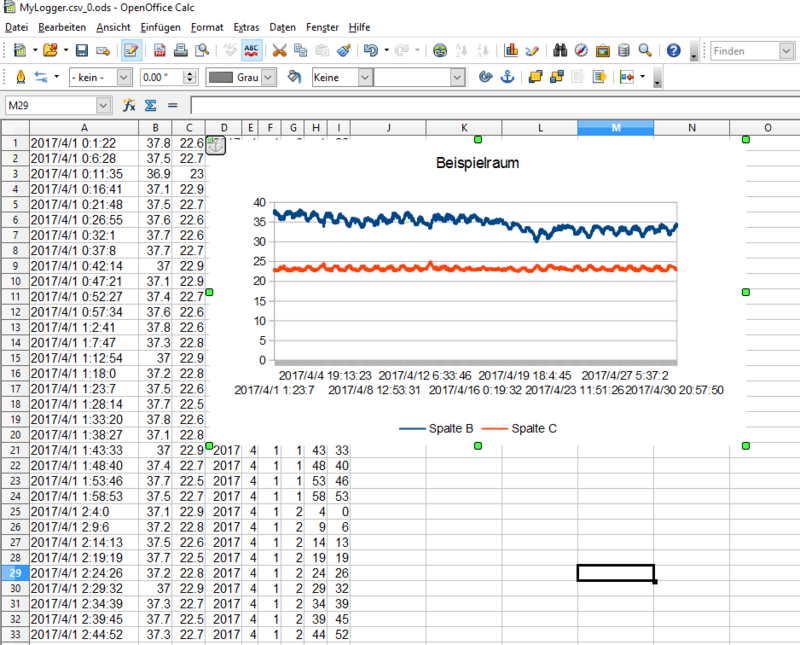 Build Your Own Data Logger – We Want Fahrenheit!